Obituaries are a way of documenting the deceased’s life. It serves to inform the public of their passing and offers information regarding the the funeral and memorial arrangements. *NAME*, *AGE*, of *PLACE OF RESIDENCE*, died (may also state *went to heaven*, passed away, has left this earth, etc. ), *DATE* (cause of death is optional, but often included). *HE/SHE* was born *PLACE*, *DATE OF BIRTH*. *NAME* graduated from *SCHOOL* and received *DEGREE* from *SCHOOL*. *HE/SHE* was married to *SPOUSE’S NAME* (you may included the date of marriage if you like). Summary of their life can go here: Things they accomplished, organizations they were part of, the kind of work they did, recreational activities etc. Funeral arrangements will be held “TIME”, “DATE” and “PLACE”. For a Longer Obituary you can follow the style below. An obituary contains several sections. The first paragraph often contains the first 4 points down below. Begin the 2nd paragraph with surviors and conclude in the third paragraph with the service arrangements. 1. Dateline – Include the city and country. This is the heading at the top of the page. 3. Very personalized area about the deceased. Included accomplishments, occupation, military service is applicable, volunteering, hobbies, activities etc. 4. Family of the deceased. You can included names of parents, family members, surviving spouse. Some additional info may be more detail about their childhood, marriage, career. 5. Survivors come in this paragraph. Depending on the age of the deceased, family members listed are usually as follows. Spouse, children, parents and great grandparents. Great grandparents is especially important if a child has passed. 6. You should concluded with the service arrangements in the final paragraph. Who has passed? What type of service? Where will it be? Finally when will it take place? View an example of the 6th point below. “A memorial service will be held French Memorial, Niagara Falls, NY on Wednesday, April 5, 2012, by the Rev. John Carter. Interment will follow in the Niagara Falls National Cemetery. The family suggests that memorials be made to UNICEF or the charity of one’s choice. When no service will be help, or arrangements are not yet completed, please state this in the obituary. This can avoid many unnecessary phone calls asking about the service and at times can bring about long explanations that could be difficult. This information should serve you well for completing the obituary. Be sure to include this as well in your Obituary Program or Funeral Program. You will be handing this out to guests at the service. It will also serve as a final keepsake for many of your guests. It is advised to find a funeral program that is tailored to your loved one. Please take a look at the large selection of funeral program templates we have available for you. We have arranged them in packages for your convenience. We have all types and suited to just about anyone and the most affordable prices. You will not find these anywhere else. such as: Printed Brochures, Thank you cards, bookmarks and prayer cards. 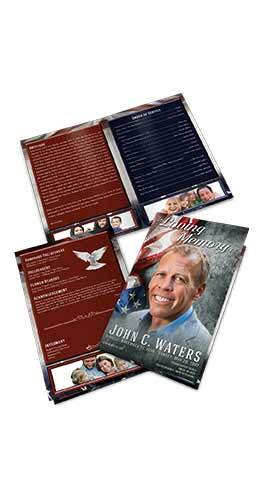 Look at our Funeral Program Templates Overview page for more Information.